Every Tuesday morning the Cabin Fever Club meet for coffee at the Sour Dough Cafe. All gold card holders, they are literary types: one former editor, one free lance writer, a novelist, a playwright, an actor and a formerly famous poet. They are cantankerous, opinionated, envious, erudite, insecure and often amusing. What binds them together is their mutual love of books. But how long are books going to last? Although these men are friends who form a supportive unit, much of the humour comes from their dry put-downs of each other. The characters revisit old grudges, bemoan their relative or actual penury, mourn the declining standards of English usage, and struggle with technology. They are at the ends of their working lives and can be thought of as the bookends that support New Zealand’s literary achievements, from poetry and play scripts to novels and travel articles. Despite their real and affected cynicism about the book world, they are still anxious to be involved. But what of the menacing advance of technology, threatening their very livelihood? The four scenes at the cafe take place a year apart, starting from 2010. Over those four years, technology is changing their lives in a way that none of them could foresee. We see them first panic, then come to terms with each new technological development, using smartphones and reading newspapers online while recalling regretfully the days when the Guardian Weekly was posted out from England. As with all Hall’s plays there are twists and turns before ending on a positive note. Come along and enjoy this comedy written and premiered in 2014. 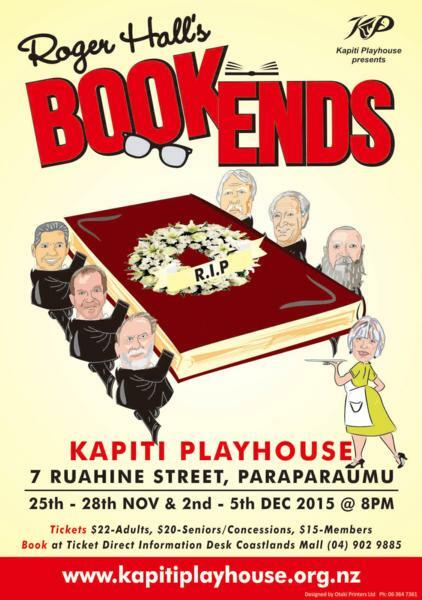 Roger Hall’s BOOK ENDS is being presented by Kapiti Playhouse on 25th to 28th November and 2nd to 5th December 2015. All performances are at 8 pm at the Kapiti Playhouse theatre, 7 Ruahine Street, Paraparaumu. Tickets are available from TicketDirect Information Desk, Coastlands Mall (04) 902 9885.